While I love to use all types of baked goods for DIY projects, I haven’t experimented too much with the famous french macaron. I’ve definitely tried to bake these and after a few failed attempts, I quickly gave up. 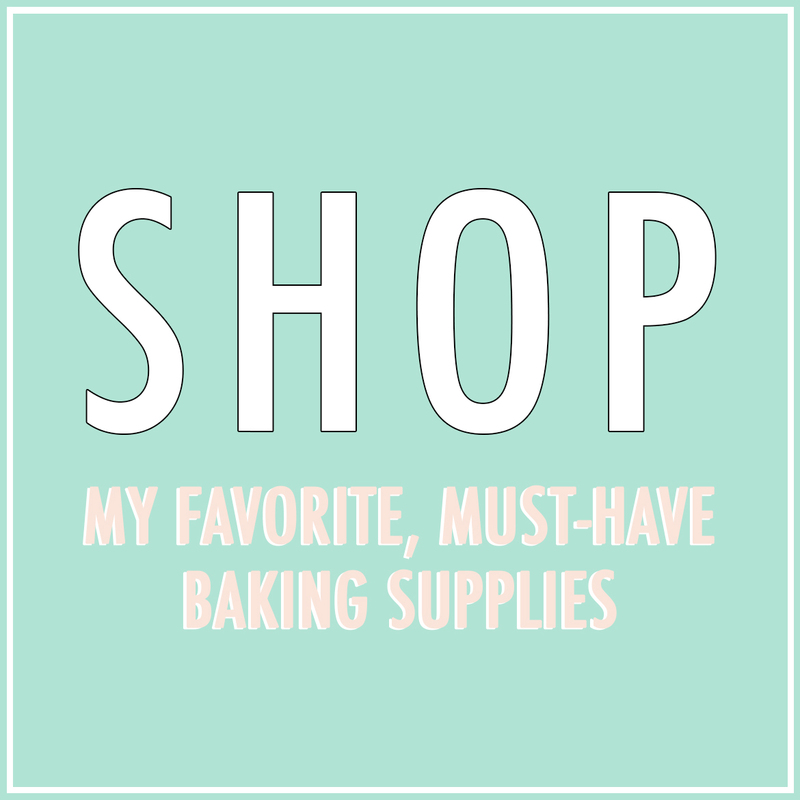 Baking macarons just ain’t my thing, however, eating macarons…well that most certainly is my thing! Lucky for me, I had the absolute pleasure of meeting one of my favorite macaron makers a little over a year ago, Dana of Dana’s Bakery. I have tested a fair share of macaron bakeries in New York and by far, Dana’s Bakery holds precedent in my opinion when it comes to taste and flavors. 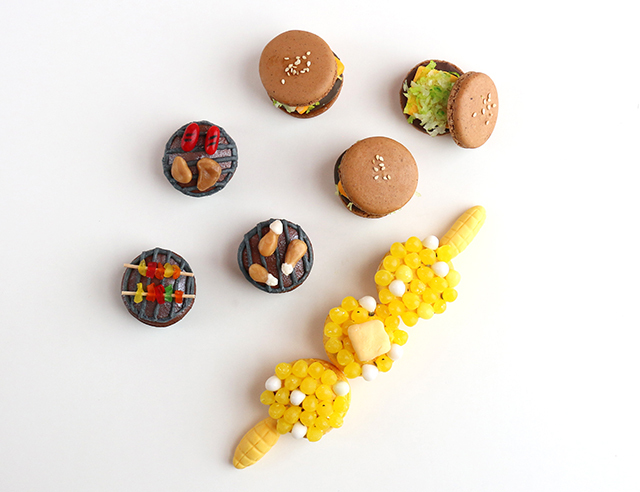 On top of making the most delicious macs (and shipping nationwide! ), Dana of Dana’s Bakery is such a force – a go-getter in every since of the word and a very inspiring, powerful girl boss! So, when I decided I wanted to step my feet (and my blog) into the DIY macaron world, Dana was the first place I went…because if I could make fun DIY’s with delicious macarons that wouldn’t result in frustrated baking experiments, why not go for my favorite macs?! 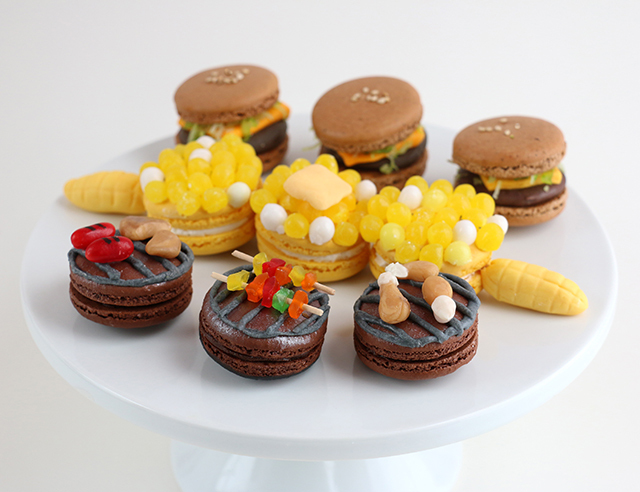 So with all that said, I present to you the first Alana Jones-Mann X Dana’s Bakery macaron collab – a set of Summer BBQ-themed Macarons! With summer officially just 3 days away, make a batch of these to bring to the next BBQ you head to – they will surely turn you into the most talked about guest at the cookout! 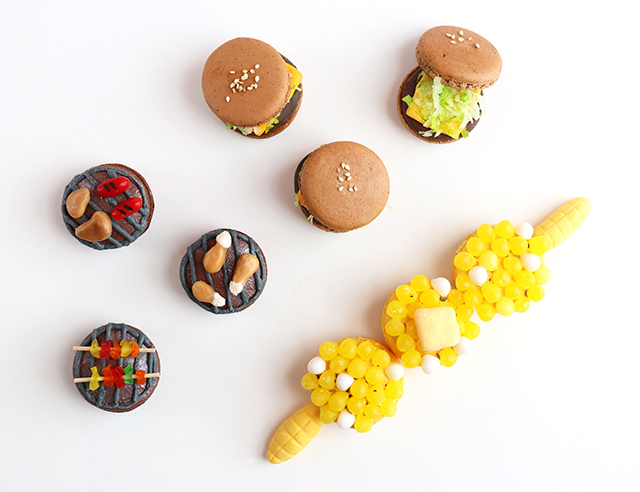 Below you’ll find the DIY for the bbq grill macarons, a cheeseburger macaron, and a 3-macaron corn on the cob. I’ve seen variations of these on cupcakes for years now, but wanted to out my own spin on them…and put them on macarons! 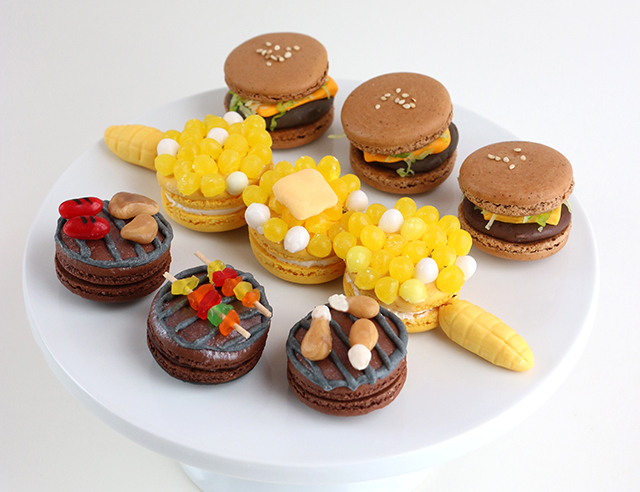 There’s also a pie macaron to top things off, because no barbecue is complete without desert! I’ve listed the ingredients and steps for each themed macaron individually so you can choose to follow along with just one, or all of them. Click through for the DIY and many more photos! UPDATE: Dana’s Bakery put together a shop-able box of the macs you’ll need for the DIY – you can buy that HERE! Step #2: Add 1/2 cup of white chocolate chips to a microwave-safe bowl and melt the chocolate chips (15 second intervals in the microwave, stirring in between each interval). Once your chocolate is melted, add one drop of black dye to obtain the slate gray grill-top color and mix well until combined. Add your gray-dyed chocolate to a piping bag (or a plastic bag) and cut an end for the tip. You can also use a small circular piping tip, if you have one. 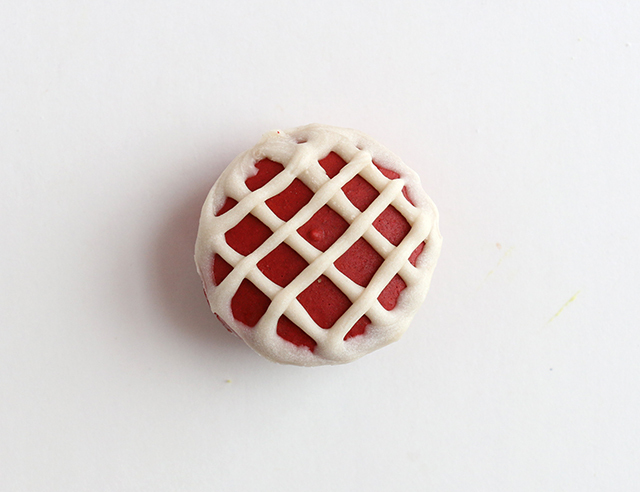 Pipe around the edge of your macaron, and then pipe horizontal lines across the macaron (the grill top). Set the macaron in the fridge for 10 minutes to set. 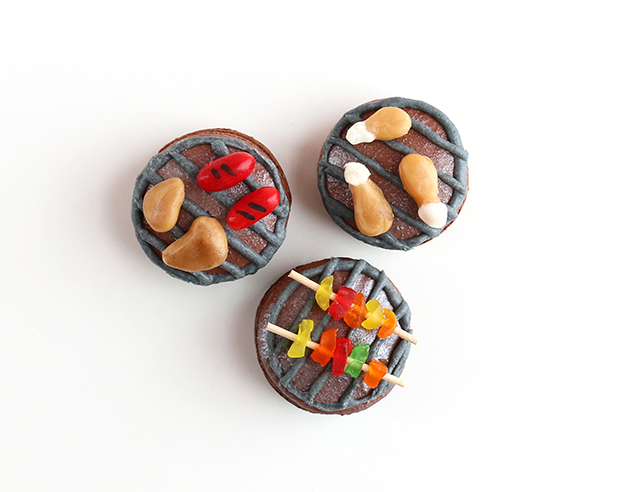 Step #3: While the chocolate is setting, make the toppings (the “food”) for the grill. Using small red candies (i.e. 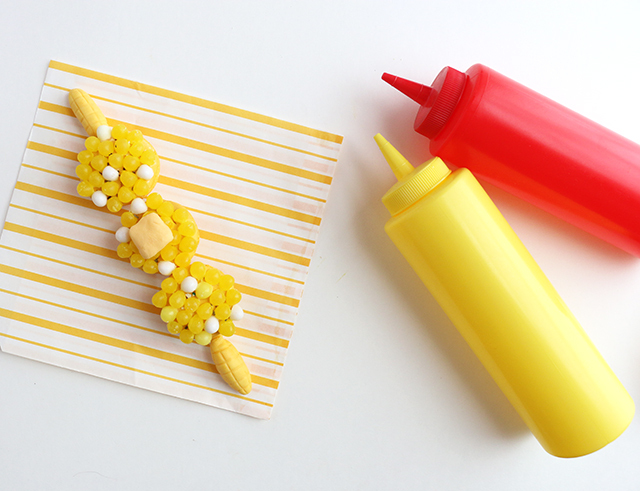 Mike&Ike’s) and an edible marker, add grill lines to the top of the candies to resemble hot dogs. For the chicken, take a caramel square and mold it into shapes of chicken thighs and drumsticks. [Note: For an added detail you can dip the ends of the drumsticks into white chocolate]. For the kebabs, cut apart colorful jelly candy (i.e. 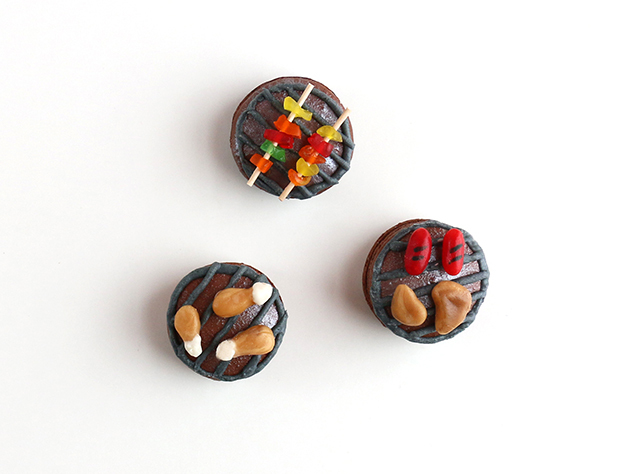 Jujubes) into small pieces (“veggies”) and position on a toothpick (the “skewer”). 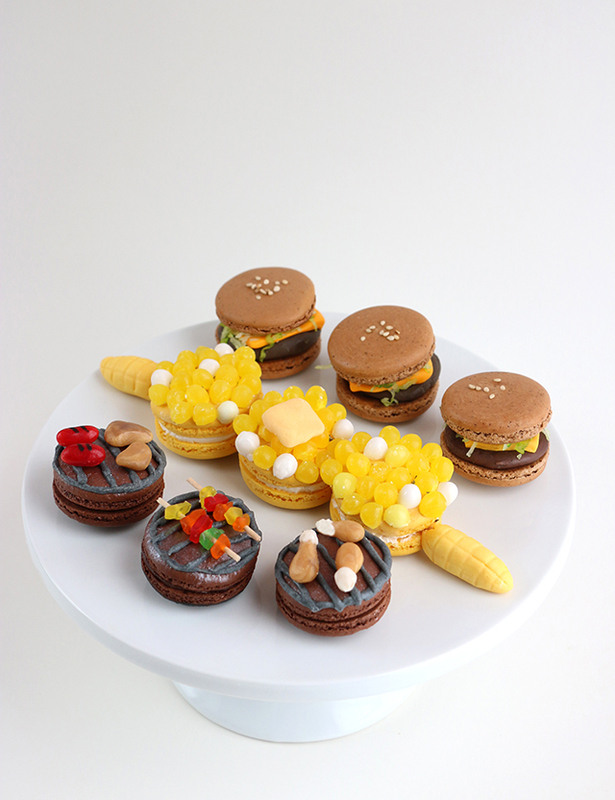 Once the candy toppings are ready and your chocolate has set, position each item atop the macarons. Use a small drop of leftover melted chocolate to secure on top of the chocolate grill lines, if needed. When it comes to eating them, I preferred to eat the candy “food” first before chomping into the chocolate-topped macaron. 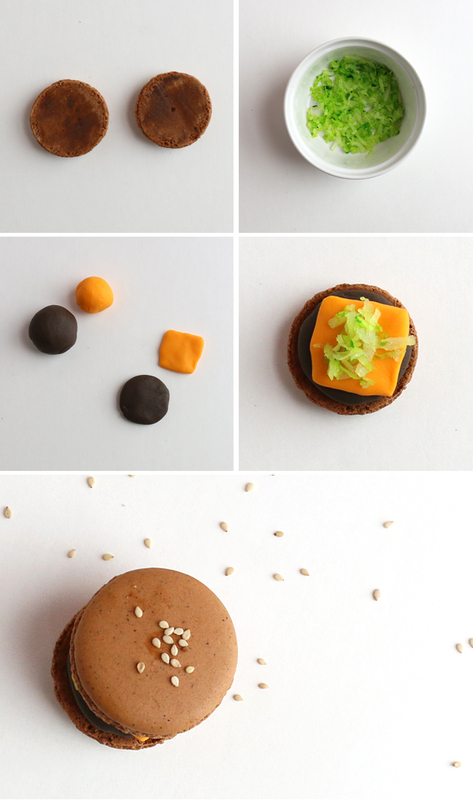 Step #1: For the burger macaron first remove any interior filling. To make the lettuce, add the coconut and a drop of green dye into a plastic bag. Shake until the color has evenly coated the coconut. 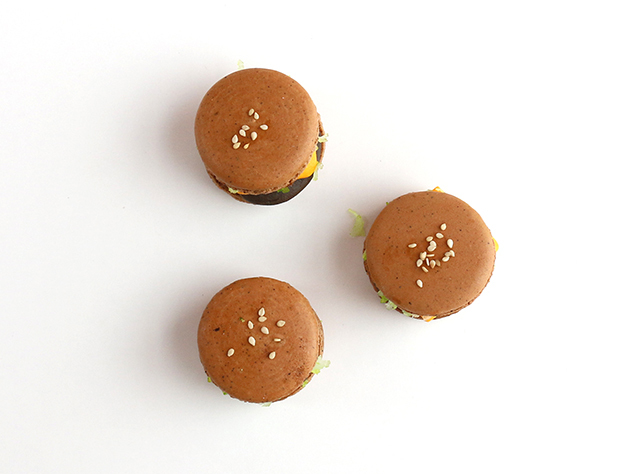 Step #2: With your two colors of modeling chocolate (or fondant), first roll out a small ball of the black-brown color and shape it into a burger patty, just smaller than the macaron. For the yellow-orange fondant (your American cheese), roll out a small ball into a square shape for the cheese slice. 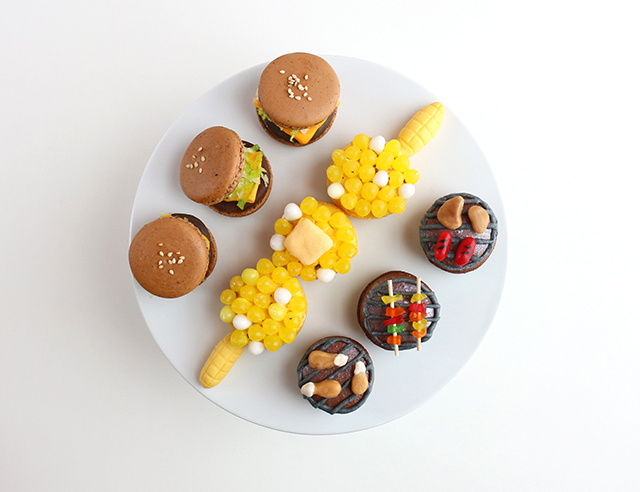 Note: To get extra fancy, you can also create additional toppings for your burger (red-tinted royal icing for ketchup, modeling chocolate for onions or pickles, etc.). 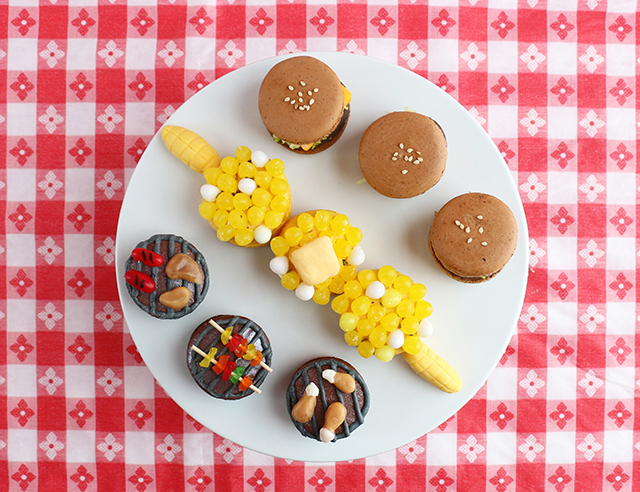 Also if modeling chocolate or fondant isn’t accessible, get creative and use other candy for the burger patty and cheese (a rolled out Tootsie Roll for the burger patty, yellow Starburst for the cheese). Step #3: Once you have all your toppings prepared, layer them on your burger – first the patty, then the cheese, and top it off with the lettuce. 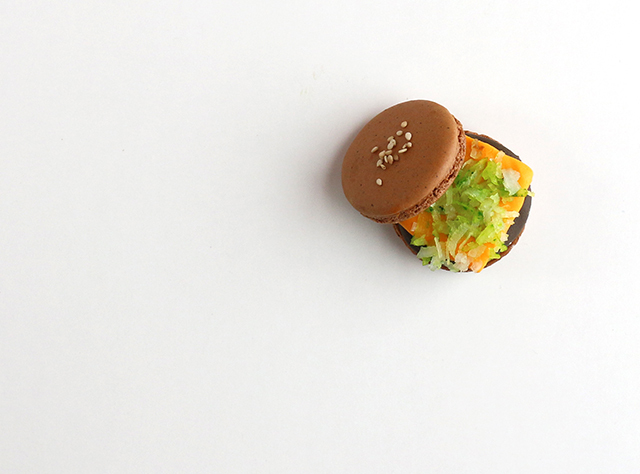 Add the top shell of the macaron to close your burger, add a tiny drop of water atop the center of the macaron and sprinkle on a few sesame seeds to finish it off. Step #2: In a bowl, mix 2 tablespoons of confectioners’ sugar with a couple drops of water. Mix well until you have achieved a glue-like substance. 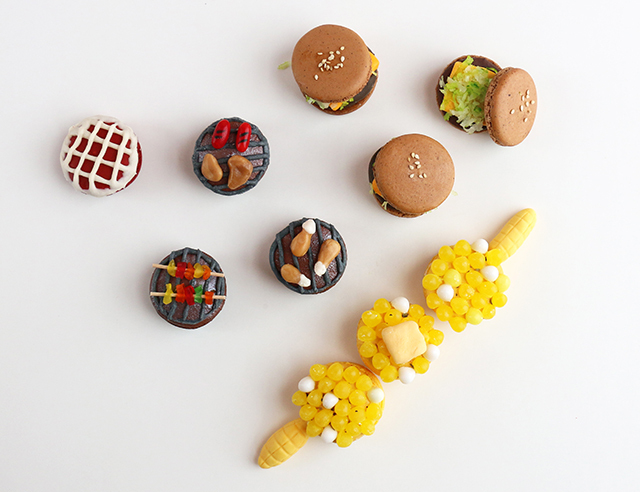 Brush the sugar glue atop one of your macarons, and align the jellybean pieces atop the glue. 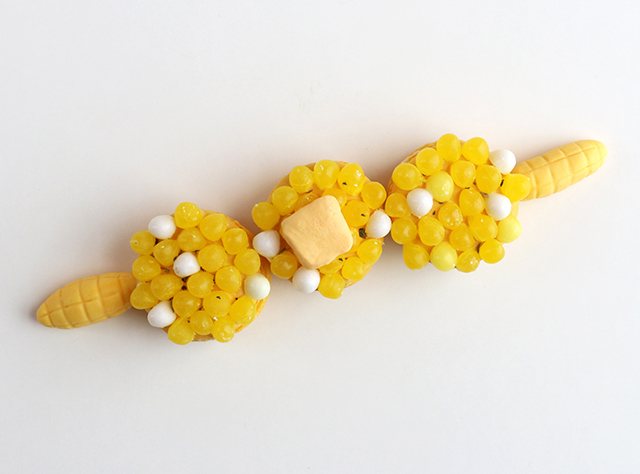 [Note: Since macarons don’t have a wide circumference, it’s a bit difficult to get the jellybeans to all line up in perfect horizontal lines, but in the end you’ll see it doesn’t really matter if it’s perfect or not..it looks like corn on the cob regardless!] Repeat the process for all three macaroons. Assemble in a line once finished. Make sure to remove the toothpick ends before eating. Similar to the bbq grill macs, when it comes to getting to eat these, I enjoyed the jelly bean “corn” first and then got to work on that delicious mac second. 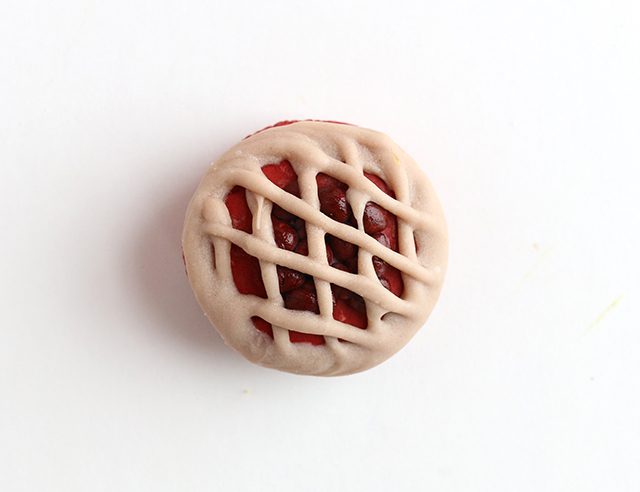 If you’d like to make the pie macaron, use either a red mac (for a cherry pie) or a blue mac (for a blueberry pie). Just as you did with the chocolate for the bbq grill macs, melt a handful of white chocolate chips and then add a drop of tan coloring (or 2-3 chocolate chips) to the white chocolate once melted. Once the chocolate is colored a crust color, add to a piping bag (or a plastic bag) and cut off the end to create a tip. [Note: You can also use a small circular piping tip, if you have one.] Pipe around the edge of your macaron, and then pipe diagonal lines across the macaron (to create the “crust” for the pie). Set the macaron in the fridge to allow the chocolate to set before serving. For those of you who want a more semi-realistic pie look, add small balls of candy or chocolate atop the macaron prior to piping on the crust to achieve a raised pie look.